The Schwinn name is so synonymous with cycling that we often forget that they actually offer a lot of other fitness equipment. The Schwinn Crewmaster Rower is proof that their expertise extends well beyond the world of biking. Let’s take a close look at what the Crewmaster has to offer to see if it is the right rowing machine for your home gym. The first thing I want to point out is that the Crewmaster is a magnetic rowing machine. Rowers come in 4 varieties: hydraulic, air, water, and magnetic. Each has their perks and downfalls. If you are looking for more information on the different types of rowing machines, you should check out my rowing machine guide. 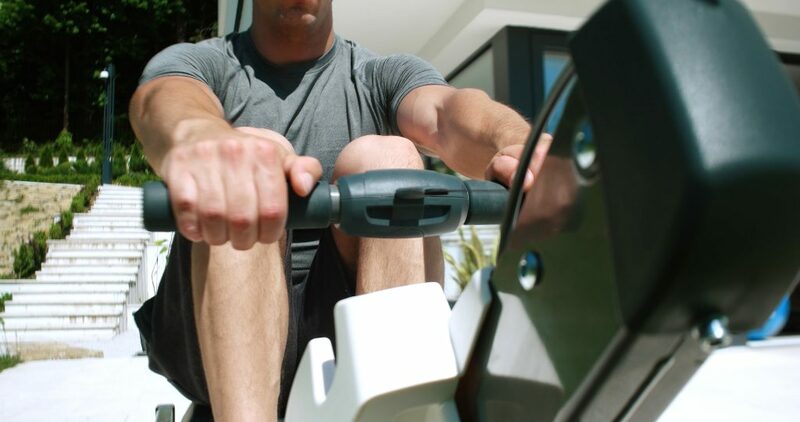 As a magnetic rower, the Crewmaster comes with adjustable resistance. Some of the other types of rowing machines don’t. This means that when you set your resistance, every time you pull you will be getting the same amount of resistance from the machine. This is convenient if you are looking for a consistent feel for each pull. You can adjust the resistance level simply by turning the dial located in front of you and off you go. The Schwinn Crewmaster offers 10 levels of resistance. This should offer enough play in the resistance to make both novice and advanced rowers happy. It also gives you the ability to perform different styles of workout, such as HIIT or lower intensity cardio workouts. The other biggest benefit of having a magnetic rower is how quiet they are. The resistance is created from magnets and a metal wheel (that spins when you pull, kinda like the flywheel on a spin bike). The closer the magnets are to the wheel, the more resistance you get. The farther apart they are, the less resistance you get. Since there is no contact between the moving parts, there is very little noise. That’s why so many people love magnetic rowing machines. They are virtually silent. They are easy to use while watching tv or while family members are still sleeping- a nice perk if you will be exercising early in the morning or late at night. The Schwinn Crewmaster creates very little noise during use. To take this one step further, Schwinn threw in a nylon transmission rope. The nylon strap works very smoothly without any added noise. Some rowing machines use a chain- which is durable and effective, but a little noisier. Schwinn’s legacy is built on their reputation for producing high quality gear made out of durable materials. You know, stuff that works well and actually lasts. Luckily, they stayed the course when they designed this rowing machine. The seat glides smoothly on the roughly 5 foot long steel rail. Overall length for the machine is about 93″, so it’s just under 8′ long. Something to consider- decent rowing machines take up a good chunk of floor space. Luckily, they aren’t very wide (21″). But you are going to want a long rower if you are a taller individual. A longer rail means more room for you to extend your legs fully during your workout. But the steel frame is sturdy and durable. The Schwinn Crewmaster has a max weight capacity of 300 lb, which is pretty good for a mid-range rower. We should expect more from a more expensive, high-end rowing machine. For comparison’s sake- the Concept2 Model E (arguably the nicest rowing machine on the market) has a weight capacity of 500 lb. But costs roughly 2x as much as the Crewmaster. The LCD display screen on this rower is well sized. It’s big enough to read easily during use and it functions effectively to keep track of all the standard workout metrics you’d expect on a rower. But it isn’t particularly sophisticated. It doesn’t offer bluetooth connectivity for use with fitness apps and the workout options are limited. It is telemetry (wireless chest strap) heart rate monitor compatible though, you just need to provide your own. It would be nice if one was included. Now rowing machines don’t usually have all the workout programs you would expect in a treadmill or elliptical, but the Crewmaster only lets you select workouts based on your goal- such as distance, time, or count. No games or workout competitions for added excitement during your workouts. My favorite part about the console is that it is adjustable. You can adjust the position of the console to ensure a comfortable viewing during your workout, regardless of your height. That’s a nice touch. Schwinn did a nice job of making this rowing machine as comfortable as possible. One of the biggest complaints people usually have about rowers is how uncomfortable the seat is. It’s true- the seats are usually hard and flat, not a particularly good combination. The seat on the Crewmaster is contoured, padded, and large. It was designed with ergonomics in mind to keep your rowing experience as painless as possible. Users agree they did a pretty good job. The foot pedals are also oversized and adjustable. This should ensure a comfortable fit regardless of your size. It will also make sure your feet are stable during use- it’s annoying when the foot straps are too loose or don’t fit correctly. The result ends up being your feet sliding around while you try to row, making it very difficult to get in a good rhythm. Well, this shouldn’t happen on the Crewmaster. I’m not sure if this adds to your comfort or not, but I guess I can discuss it here: the Crewmaster folds for storage! I mentioned earlier how long quality rowers are. They take up a lot of real estate, but being able to fold this one in half saves room when you’re not using it. Pull a pin and the Crewmaster is ready for storage. The folded length is only about 50″, so it does drastically reduce its footprint. When it’s folded, it can easily be rolled away to a corner of the room or a closet with the built-in transport wheels. Putting the Schwinn Crewmaster together is pretty straightforward. The instructions make sense and are easy to follow. All necessary tools are included (even the batteries)- couple of Allen wrenches and a screwdriver is all it takes. I like that the assembly illustrations are actually large and easy to follow. Sometimes the pictures are so small it’s impossible to tell what is going where. Schwinn keeps it pretty simple here. Most users agree assembling the Crewmaster wasn’t an issue. Most folks should be able to have it out of the box and ready to roll within 30 min or so. F0r a rowing machine in this price range, 10 years on the frame is awesome. Some of the nicer, more expensive rowing machines don’t offer a warranty this generous (I believe there’s only a 5 -year warranty on the Concept2 Model D). The Crewmaster has a lot going for it. As a magnetic rowing machine, it’s very quiet. The 10 resistance levels should be enough for you to adjust your workout accordingly regardless of your fitness level. It’s also packing a lot in the comfort department- large padded seat and oversized foot plates should go a long way to make your workouts feel better. I also like that it folds in half and is easily stored. The biggest downside to this rower for me is the monitor. It’s easy to read, but it doesn’t provide any advanced workout programs or bluetooth capabilities. It is compatible with telemetry heart rate monitors, but one isn’t included. Overall, I think the Crewmaster is a nice mid-range rower. It’s priced well and is backed by a great warranty. Schwinn is a legend in the fitness equipment world, known primarily for their road and exercise bikes. But this rowing machine is proof their other products are worth looking into. The Schwinn 830 Treadmill Reviewed – A Worthy Investment?